…and it most certainly doesn’t always win the race. After having spent a week in Myanmar, we were accustomed to the feeling of going back in time. We were used to seeing horse and ox carts on the streets. We had learned not to expect hot water and stable electricity. We weren’t surprised when the bank told us at 10:30am that they were waiting for the official exchange rate from Yangon and so we couldn’t exchange our money. Buses without doors, bathrooms without toilets (just a simple hole), dishes washed in a river or lake, bicycles with sidecars, cars with diesel engines spewing out black smoke…after a while, you adjust. 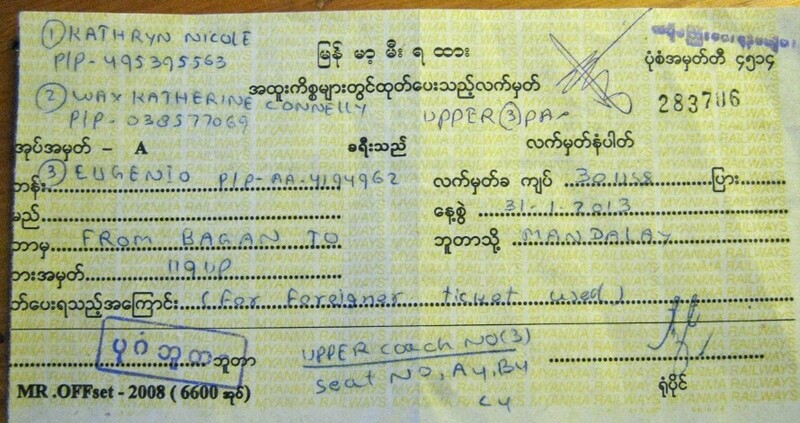 Our adventure started at 6:30am at the ticket office inside the Nyuang U train station. It’s not possible to purchase tickets in advance, online or otherwise, but we were told that a half hour was needed to obtain tickets and board the train. We were only 4th in line, so we had more than enough time, right? Wrong. 25 minutes and 3 customers later, we approached the window, handed over our passports, held up 3 fingers and said, “Mandalay?” at which point we figured out why this process was painfully slow. The man behind the counter, working by candlelight, started to handwrite our tickets on carbon copy paper – something I haven’t witnessed in at least 20 years. And since the Burmese alphabet has absolutely no resemblance to our own, watching him write our names and passport numbers in English was nothing but torture. Once at the counter, it took 10 minutes to buy our tickets. Luckily, they held the train for us and for the remaining people in line. We climbed into our “Upper Class” cabin. Normally I don’t splurge on first class treatment, but we heard stories about the normal class: wood benches, enormous bags of produce, seat-less passengers filling the aisles and thereby making the bathroom inaccessible. I could handle that for an hour or two, but 7 hours was a bit much. Why did it take 7 hours to go 200 kilometers? We had thought it was due to the number of stops, but in reality it was because the train could not physically go any faster without risking derailment. We were lucky that we all have strong stomachs. And thank god we weren’t on wooden benches! !